A strong northwest flow covers the South Island ahead of an active front over the Tasman Sea. This front moves over southern New Zealand on Tuesday and is preceded by a period of gusty northwest gales for some areas. 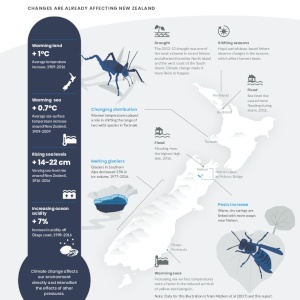 The front which brings the rain to the South Island is forecast to move through on Wednesday, with a much cooler southwest change in its wake, resulting in lower overnight temperatures for the South Island on Thursday morning. Gales are also forecast for southern and eastern parts of the South Island, as well as central New Zealand, with numerous Watches and Warnings in place from Wellington and Wairarapa southwards. People need to be aware this is a significant event, and to visit www.metservice.com for the up-to-date forecast information on Warnings and Watches. A brief ridge of high pressure builds over the South Island on Thursday, bringing light winds and clear skies overnight. Friday morning looks cooler still, with dawn temperatures around 6C in the south.